It is significant that Sathyanarayana was giving clues about his kinship, nay, identity, with the Saint of Shirdi, even from his childhood. When he taught his companions songs on a Babaji whom no one had seen or heard about, and on a Place of pilgrimage to which no one who heard the songs, had gone, people wondered! Where is this Shirdi, they asked each other. Who was this Muslim Fakir? Little did they realise that the child in their midst, singing and dancing so captivatingly was, in a few years, to make their village another Shirdi to which hundreds and thousands seeking the same Baba will be coming! When finally the formal announcement was made by Sathyanarayana that He was Sai Baba, of Bharadwaja Gothram, Apasthamba Sutram, and of Shirdi, he was asked, "If you are Sai Baba, show us some miracle now! ", and, the boy, said, "Bring me some jasmine flowers"; when they were placed in His hands He threw the flowers on the ground and, lo, they fell in the form of the Telugu letters, Sayi Baba, flower behind flower, as if arranged with meticulous skill, all the curves and convolutions of the Telugu letter perfectly reproduced! The elder brother, Seshama Raju, who had learnt by long practice to live with the miracle boy, was himself surprised at the emphases of the revelation. "Of course, I gave them the name of the Avathar that had just preceded mine," said Baba when questioned about these incidents. "It only meat that He who came as Sai Baba has now come again as Sathya Sai Baba! Moreover, the Sais come in a series. After this Avathara, there will be another, Prema Sai, who will take birth in the Mysore region" He added. In spite of all this, the parents and the brother gave ear to men who shook their heads and warned them of the Muslim Ghost that seemed to have possessed the boy. So, they took Him eighteen miles off, to Penukonda, where at that time there was a very devout individual, attracting large crowds every Thursday by his Puja of Sai Baba. He looked at Sathya and said that he was doubtful of his sanity! The boy rose up in disgust, calling that worshipper himself mad, and throwing large quantities of Vibhuthi at him from His empty hands, advised him to be more sincere and earnest in his Puja. "You are only a seeker, a servant, I am the Person you seek, the Master," He declared. About this time, two teachers who had known Sathya as their student at Bukkapatnam visited Puttaparthi. Fortunately for us they have recorded in print what happened. Sri B. Subbannachar, one of the two, says, "My first impression about him was that he was a great devotee like Prahlada. I saw Him doing miraculous deeds. I was convinced that He was not an ordinary human being, but a boy, endowed with supernatural powers. Quite to our wonderment, this Mad Boy of Puttaparthi revealed to us that He was "none other" than Sai Baba of Shirdi! He also asked us to stay there for the night, when he would narrate His life-history! We wanted to hear about His life history, as the available books on Sai Baba do not give us any information about His infancy and boyhood up to 16 years. He granted us this boon even before our asking! Our joy knew no bounds. Night came. We heard His life-history. We saw Sri Sai Himself with our physical eyes in human form!" What unique happiness! What boundless Grace! The other teacher, Sri V. C. Kondappa has narrated the story of Shirdi Baba's Birth and childhood as given by Sathya Sai Baba, in 102 Telugu Slokas, in the book, "Sri Sayeesuni Charithra," published in 1944. This story will certainly be of immense interest to all devotees. "In the village Pathri, on the banks of the Godavari, there lived a pious, charitable and orthodox Brahmin named Gangabhava; his wife, Devagiramma was a virtuous woman engaged daily in the worship of Gowri, the Consort of Siva. They had no children and that was perhaps the only sorrow they ever felt; for, they were always immersed in the service of either the Lord or, the guests whom the Lord sent to their door. One day, a guest arrived, a person of striking mein, with a tinge of halo round his head! When retiring for the night, he made the astounding request, for female company! Poor Devagiramma was so shocked that she could scarce speak; Gangabhava too was burning with indignation, but, of what avail was indignation against a guest who was demanding hospitality? Devagiramma went into the shrine-room and wept before the image of Gowri, seeking her intervention and her advice. Suddenly, a knock was heard at the front door and when it was opened, a female with all the artificiality of a public woman, entered the house. "It seems you sent for me; where is the guest? Take me to him," demanded the newcomer. For, it was no other than Gowri, come to meet the Guest who was no other than Siva! Once in the same room, Siva and Gowri had a hearty laugh together. They spoke to each other praising the devotion of the couple and their adherence to Dharma. They decided to give the two their Darsan as well as a boon. Needless to say, Gangabhava and Devagiramma were delighted at the Darsan and, when pressed to express their wish, they asked for a son 'to repay the debt due to the ancestors,' and a daughter, 'to be given away,' Kanyadan being according to the Sastras the most effective Dan that a house holder can give. The boons were granted. Then, Siva out of His own Grace gave the couple a boon, unasked. He told them that He Himself will assume human form and be born as their third child. It all happened as the Lord said. Devagiramma conceived the third time; but, the husband got by that time so immersed in Tapas that he started for the forest; the wife too insisted on accompanying her master; the child was delivered under a tree, with birds cooing welcome and the clouds building an arch of seven colours to celebrate the occasion. So full of the spirit of renunciation were the parents that they left the new-born babe to the protection of the angels of the forest. Very soon, there passed along that solitary track a Fakir and his wife, a childless couple, who heard the baby's cry and hurried to the spot; they took it home, and brought it up. They called it simply Baba, for they knew not its ancestry or affiliations. The child was fair and intelligent and full of wiles and pranks. One day when he was about 12 years old, while playing with some companions he won all the marbles belonging to the Sahukar's child. Baba challenged the Sahukar's son to bring more marbles, if he has got them and offer them as stake. The boy ran into the house and brought out the round Lingam, kept in the shrine-room. Baba won that too, and when it was duly handed over, he just swallowed it whole! This created a sensation among the children, and the Sahukar's wife was informed that the Lingam had gone into the stomach of the Fakir's son. She ran forward and threatened Baba with a stick; Baba opened His mouth and, lo, she saw therein all the ten Avatars of Vishnu! She folded her arms and fell at the feet of the Fakir's boy, in the open street! It became the talk of the town. The boy was in the habit of taking out the Lingam that he had swallowed, and he used to worship it sitting in the mosque. This enraged the Muslims of the place and they excommunicated even the Fakir who had brought up the child. When the boy went into a temple to worship that Lingam, the Hindus drove him away, since they feared he was a Muslim by birth. Finally, the Fakir most unwillingly asked Baba to quit the house; and the boy wandered about, doing Puja to the Lingam, placing before it a lamp with water instead of oil, but which never the less burned like an oil lamp! He was moving along the banks of the Godavari river, when he was accosted by a Nawab, who asked him if he had seen his horse which had strayed away. The Nawab had searched for it over all the surrounding area and had lost all hope. Baba, by His Divine insight, saw the horse and he told the Nawab that it would come towards the place where they stood, and even while they were talking, the horse trotted in, to the extreme joy of the owner. The Nawab became His disciple and addressed Him as Sayi or Master. Later, Baba came to Shirdi village and established himself in a ruined Mantap there." Sathya Sai Baba invariably refers to 'my previous body' when He speaks about Shirdi Baba; He often describes to His devotees how He, 'in His previous body' dealt with people and situations, what illustrations He gave to amplify a certain point, what questions were asked, etc. He quotes what He told Das Ganu or Mahalaspathi in 'the last birth.' While telling people about Shirdi Baba, He may be heard saying, "Just as you have seen me do now" or, "Just as I do while in trance," to make the point clear. When some one asks Him a question today, He starts His reply sometimes with the remark, "The same doubt was raised by a man who had come to Shirdi" and He will continue the conversation with the reply He gave that other man long ago in Maharashtra! He recognises all devotees of Shirdi Baba as His own; in fact, He tells them, "I have known you since ten years," or, "Though this is the first time you see this Sariram I have seen you twenty years ago, when you came to Shirdi." And, the person will find that he has been to Shirdi exactly twenty years previously! He has encouraged many to go to Shirdi giving them detailed descriptions of the route, the place, the methods of well irrigation prevalent there and even the pictures kept round the Samadhi! It would appear to a listener that He has long been a resident of the area. When some devotees went once to Shirdi, Sathya Sai Baba told them, "Go and sleep in Dwarakamayi. I shall come in your dream" and He fulfilled the promise! There are cases of people who had been to Shirdi and who while returning, heard near Guntakal or somewhere, that there is an Avathar of Sai Baba at Puttaparthi and they have come to this place. As soon as He sees such, Baba asks them about the Shirdi pilgrimage. He answers during the interview that He invariably gives to every one before he leaves, the questions which they took to Shirdi! This has been the experience of not a few. The Raja of Chincholi was a very ardent devotee of Shirdi Baba. He used to spend a few months every year at Shirdi, Akalkot and other holy places in the company of Siddhas and Sadhaks. After the passing away of the Raja, the Rani was pleasantly surprised to hear of the incarnation of the Lord as Sri Sathya Sai Baba at Puttaparthi and she visited the place. She also persuaded Baba who was just fifteen years of age at that time to accompany her to Chincholi and Hyderabad. What a surprise it was for her, when Baba asked her about a Margosa tree later uprooted, a well that had been filled up, a line of shops that had been newly built. Baba told her that He had seen the places years ago while 'in His previous body!' Sathya Sai Baba asked her about a small stone image of Anjaneya which had been given to the Raja while in the previous body; the Rani did not know that it existed; Baba himself discovered it for her! He also said that there must also be found a picture of Sai Baba and that too was later discovered in the house. Three years ago, the Rani was rummaging the huge store room at Chincholi for old brass, bronze or copper which she could sell off and save space. She came upon a Kamandalu of brass, a drinking vessel used by Sadhus, whose shape was quaint and artistic. The water has to be poured through a slit in the handle and the spout ends in a cow's-head figurine! Some one suggested that it could be polished and displayed as a decorative article in the drawing room of her Hyderabad House. The mystery of the Kamandalu deepened next day when they found a cobra coiled round it! "Baba alone can solve the secret," she said to herself, while propitiating the cobra with the traditional Puja. She arrived at Puttaparthi on the first day of Dasara, and as soon as she entered the premises, Baba sent word, asking her to come up, "With my drinking vessel"! No sooner was the Kamandalu in His Hands than He showed, to the Bhaktas nearby, the letters inscribed on the vessel in Devanagari characters, 'S A A' followed by a pair of short vertical lines, 'B A A' with the two lines again. 'SAA' indicating Sayi and 'BAA' for Baba! Surely the ways of the Lord are mysterious! Baba has since said that He will get like this the Jolige or alms-bag of Shirdi Sai Baba also, in a few years, from wherever it is. Readers may wonder how the saint of Shirdi, who, according to all accounts, never left Shirdi for years and years, could have gone to Chincholi and Hyderabad, and left a Kamandalu with the Raja. In fact, it is the honest belief of the Rani as well as some old servants of the Palace that Sai Baba stayed a few days every time he came and that he used to ride in a Tonga drawn by bullocks far out of the town, in order to have talks with the Raja who accompanied Him. This Tonga too is now at Puttaparthi. But, devotees who have seen and experienced the Avathar of Sri Sathya Sai Baba will have no difficulty on this score, for, they know how Baba can be at Madras and yet "take tea with a family at Bangalore as happened once, in a bungalow at the Civil Station!" He can hold conversation with a man at Bhopal or be seen at the stall in an Exhibition in Delhi or speak on the phone to Menon in Madras, all the while being at some other place. To take just one instance out of many. There was a family at Hospet, well known to Baba since childhood. The eldest sister was a teacher at a school, the brothers were his classmates at Bukkapatnam and his playmates. They had heard about the Manifestation and had seen Him also at Puttaparthi. It was a year afterwards, in 1941, that one evening a bullock bandy brought Sathya Sai Baba outside their door. Their joy knew no bounds. The whole night was spent in talk, Baba lying down with one of the boys on each side of Him, laughing and jeering at all the jokes with which they enlivened the conversation. The mother made preparations for an oil bath for Baba the next day and a feast, but how can her disappointment be described when she found in the morning the bed empty and Baba gone! On enquiry she found that Baba had never left Puttaparthi, a hundred miles away! Avathars are not bound like us, by limitations to time and space. They are a Law unto Themselves! When He addressed a meeting at the All-India Sai Samaj at Mylapore, Madras, last year, Baba's opening words were, "Though this is the first time this Sariram has come here, I have all along been here, in this Mandir"! This identity and unbroken continuity are emphasised by Him in a hundred different ways, on all conceivable occasions. Only the other day, at Coorg, He recognised at sight an ardent devotee of Shirdi Sai Baba, and even noticed with pleasure that He is a Life Member of Sai Baba Trust. He has vouchsafed to His devotees lockets and talismans with pictures of Shirdi Baba, or of Shirdi Baba, with His own portrait incorporated or His picture with the portrait of Shirdi Baba in the region of the heart. As a matter of fact, no distinction is made or allowed to be made, in worship or Puja between Himself and the 'previous manifestation.' In fact, there are in the Prasanthi Nilayam Prayer Hall two pictures which demonstrate this continuity. They are both captivatingly charming and the artist seems to have caught the moment when Sai Baba is taking over the Mission again. The grandeur and the historicity of the moment are very attractively brought out in these pictures. Besides, it has to be noted that a silver figure of Shirdi Baba is the central point towards which all the prayer at the Prasanthi Nilayam is directed, Baba Himself supervising the performance of Abhishekam to 'the Previous Body' on such holy days as Vijayadasami or Mahasivarathri. Baba establishes His identity and continuity by means of a series of significant acts. For example, the image of Shirdi Baba is decorated with garlands that have been offered to Him, and no difference is ever made between what may be called these "used" garlands and other fresh ones; both are used for decorating the image. During the nine days of Navarathri, women at the Nilayam offer Kumkum Puja and all the Kumkum thus offered is collected and kept, for use on Vijayadasami Day, when it is all poured ceremoniously on the silver figure of Shirdi Sai Baba! It is as if Baba Himself has accepted it and done Abhishekam with it for Himself! He is Shirdi Baba Himself and it is He that is worshipped. He has told many people. "You need not wait until you are able to meet and ask me; you ask the Old Man down below," meaning Shirdi Baba. On the raised platform at the Prayer Hall, facing the assembled devotees, are two life-size oil paintings, one of Shirdi Baba and the other of Baba, both standing and both crossing one hand over the other, Shirdi Baba holding His right hand with His left and Parthi Baba holding His left hand with the right. The knot of the cloth round Shirdi Baba's head, usually brought to the left, is here found on the right of the head! This is rather intriguing to some people, for they do not know that when the artist who painted the two portraits wanted pictures to copy and enlarge, Baba waved His Hand and, lo, there were two small pictures ready therein! The picture of Shirdi Sai Baba that He materialised had the two hands in the new posture and cloth knot to the right! And so the painter who had that picture as his model put the knot towards the right! Songs and Stotras sung daily at the Nilayam make no difference between the two Babas; in fact, they refer to the identity and the continuity in unmistakable terms. In the Ashtotharasathanamavali or list of 108 names with which Baba is worshipped either in Person or through some pictorial representation, names, specifically attributable to Shirdi Baba are included. Sathya Sai Baba is addressed as, "He who was born in the village of Parthi," "He who was living in the village of Shirdi," et. Baba is also praised as "He who is the undifferentiated incarnation of Shirdi Sai Shakthi," "He who is the embodiment of Shirdi Sai." etc. The silver image of Shirdi Sai is there only as the representative of Puttaparthi Baba, for, as need arises for accommodating the latter on the raised dais, the image is removed to the right or the left of the Pitham on which Baba sits, or placed down below the floor; or removed altogether from the Hall! Once, when Baba felt that there should be a Procession into the village He said, "The Old Man shall go today," and sent the image in the decorated palanquin. Another time, while He sat inside the 'chariot,' He placed the silver figure in front and armed it with a whip, thus making Shirdi Baba, the charioteer! Baba was a young boy when He made the Declaration of His Identity; so, many a doubter posed the question, "How can we believe that you are He?" A person who had such doubts was quietened by a novel demonstration by the young Baba of Puttaparthi. The Cynic was flabbergasted by the ocular proof that was vouchsafed to him. Baba, it seems, stretched out His palms in front of the critic, and asked him to look at the opened palms. And, lo, he could see on one palm, a resplendent portrait of Shirdi Sai Baba and on the other palm, an equally effulgent portrait of Sri Sathya Sai Baba Himself! When the person who had this vision of the two palms eighteen years ago told me of this incident, a similar miracle which Baba showed a devotee at New Delhi came to my mind. It shows that Baba uses the same means even now to convince seekers that, He who had come then as Shirdi Baba has come now as Sathya Sai Baba. The Delhi devotee wrote: "One evening I was bicycling along a deserted road between Old Delhi and New Delhi cogitating in my mind on my own financial worries. I had returned from Puttaparthi some weeks ago and, though I was drawn much to Baba, I had not yet been convinced that He was Shirdi Baba again or, and Avathar. Year ago, I was advised by some one to do Puja to Shirdi Baba and I had fallen in with this new Baba of Puttaparthi. I revolved these doubts in my mind and pedalled along. Suddenly, a question, 'Finished the work for the day?' was thrown at me from behind, by a hefty individual, who was struggling to catch up by means of quicker pedalling. When I turned, I saw a fascinating smile lighting up that face; he was looking at me half-pityingly and half-affectionately. "We both rode abreast for about a furlong to the ruin he indicated, and, leaning our cycles against the wall, sat in the shadow on the eastern side. He asked me to sit opposite to him and he drew out from me my problems, one by one, by clever questionings. He said that the Guru I had providentially acquired was Bhagavan Himself. Then, suddenly rising up, He said, 'Why do you doubt it? He is Shirdi Baba Himself. See! And then He extended. His palms towards me; and, lo, I could see clearly, as if painted in Technicolor, the portrait of Shirdi Baba resplendent on one palm and on the other, the shining face of Puttaparthi Baba". "I can never forget those twin faces, lighting up the palms of that reverend old man. It came as an answer to all my doubts; it gave an anchor to the drifting soul; it provided me a new lease of life. Whenever I sit for meditation now, that scene of twin splendour comes before the eye and thrills me with a mysterious joy. The old man then rose and we both rode back to the road, on reaching which, he turned in the direction from which we had come! This was rather unexpected, for, surely, he could not have come so for just to bless me with that vision. He admonished me once again not to waver in my allegiance and lose a treasure so easily come by; and, I watched him pedal away, admiring his agility and cycling skill. But, imagine my wonder and consternation the next moment! For, he suddenly melted into thin air!" Thus, Baba gave him positive proof of the identity of the two Babas, the proof called in Sanskrit Logic, as Karathalamalaka, the visual experience, the ocular demonstration, the indisputable fact of the berry in the palm! This is a point to be noted in Baba's wonderful life: He speaks the same words of consolation and courage, He shows the same Abhaya gesture, under similar conditions, now as He did eighteen or twenty years ago as a little boy, thus showing us doubting mortals that He is an Avathar, born with the Divine Mission to uplift and guide. The same vision is vouchsafed to solve the same doubt, whether the doubter is present physically before Baba or, whether, he is far away in Delhi, cycling on a deserted road! He has given Darsan to a large number of people, wherever they are and given the lucky devotees clear indications that He and Shirdi Baba are one. Here is a case that comes to mind. When a devotee was waiting at the Bangalore City Railway Station Platform for the train to Mysore, so that she could enter the Mission Hospital for an operation, Sathya Sai Baba manifested Himself before her as a tall hefty old man, wearing a long Kafni and a cloth wound round the head, carrying a heavy stick and a bundle of clothes. Seating Himself on the same bench as the one on which the lady was sitting, the old man opened the conversation in Telugu and dissuaded her from the operation, saying that it has now become a fad with doctors to cut the patient inside out at the slightest provocation! He told her that He was just back from Shirdi, and He gave her date fruits, which He said were the Offerings from that shrine! He said that the Prasadam will cure her, and they did! He also informed her that His 'Ashram' was near Viduraswatham (on the way to Puttaparthi, in fact), and that He would be ultimately taking all the inmates of His own 'Ashram' to Shirdi! Thus we see that Shirdi Sai Baba is inextricably intertwined in the experience of devotees with the present manifestation of the same Godhead. When Puja is done by any devotee of Shirdi Baba now, Sathya Sai Baba knows about it. Once a lady at Madras, desperate because her son was badly ill, laid the child in front of Shirdi Baba's portrait. Years later, she came to know of Sathya Sai Baba and she came to Puttaparthi, with her son, then a tall muscular young man. As soon as Baba saw them, He asked the mother, "You had placed this boy under my care, fifteen years ago, isn't it?" Every year when the anniversary of the passing away of the mortal body of Shirdi Baba is celebrated at Shirdi, Baba 'transcends' this body and after sometime, when He comes back, He usually says, "I had been to Shirdi." A few years ago, while Baba was at Madras an incident happened which is inexplicable on any other theory, than the one which proclaims the identity of the two Babas. Baba casually announced to His devotees that a close attendant of Shirdi Baba will pass into Eternity on a certain date in the morning hours and that He will have to go to give Him the coveted Darsan, at the last moment of his mortal career. The Bhakthas were all apprehensive about what might happen that day; some of them were very much concerned; some were very expectant and indeed, even joyful, that they have an opportunity to see Baba blessing a disciple of His previous manifestation. For a few days they talked of nothing else among themselves; they watched the calendar and then the clock for the arrival of the historic moment! At last the day dawned and when the hour struck, Baba was, in spite of all the precautions of the devotees, in the bathroom! seeing that He did not emerge for a long time, the Bhakthas looked through the window and, finding Him actually away from His body, they broke open the door, and began to attend upon the Body and watching for signs of movement or activity of heart or pulse. They saw Vibhuthi emanating in large quantities from His Right Toe, and they could hear Him speak in Marathi and quote some Hindi stanzas. On coming back Baba told the Bhakthas the story of the passing away of the disciple of the previous body and how He had blessed him with a vision of Shirdi Baba and given him Udi, which his Guru always granted him. Four years ago, when Baba was in Hyderabad City, He was invited to the Ashram of Godavari Matha, the disciple of Upasini Baba and Shirdi Baba, resident at Sakori. Welcomed by the women disciples with Vedic Recitations and the traditional ceremonies of Poornakumbham, they offered Puja. He must have blessed them with a glimpse of His Reality and His Identity for, they expressed a keen desire to come over to Prasanthi Nilayam. But, Baba said that He is as present at Sakori as anywhere and that it is best they remain in Sakori itself. Those who are conversant with the Leelas of Shirdi Sai Baba and also the Leelas of Sri Sathya Baba may note certain differences in style, language and technique, but, as was mentioned by Yogi Suddhananda Bharathiar of Madras, who has seen and who has been inspired by both Babas, "There is an unmistakable identity of Mission and Message." Sathya Sai Baba Himself says that He is not as hard or as angry now at ignorance, negligence, disobedience or superciliousness as He was in His previous Manifestation. He explains this difference by means of a parable: "The Mother is usually hard when the children enter the kitchen and disturb the cooking; but, while serving the food, she is all smiles and patience. I am now distributing the dishes cooked then; wherever you may be, if you are hungry, and if you sit with a plate, I shall serve you the dishes, and feed you to your heart's content!" People who have read the description of the elaborate Procession to the Chavadi of Shirdi Baba, once every week, and thrilled at the grandeur of the affair, with its chariot, its caparisoned horse, its decorated palanquin and other paraphernalia might feel sad that Sathya Sai Baba does not permit His devotees to lavish all the pageantry on Him! Those who have read the description of the precariously hung plank upon which Shirdi Baba used often to sleep, might say that Sathya Sai Baba does not adopt that type of austerity. Speaking about the difficulties one naturally experiences in believing the identity of the two Babas, Sathya Sai Baba told a gathering at the All-India Sai Samaj at Madras in January, 1959, "The Avathars of Sri Rama and Sri Krishna are so different in the various incidents of their earthly careers; they also emphasised different aspects of ethical behaviour and philosophical belief; they differed in methods of teaching and uplifting; it is all a difference in emphasis rather than in basic things. It is difficult to get convinced that Sri Rama is Sri Krishna, but, few have any doubts on that score. So, too, those who can delve deep into these My mysteries can understand that the same Power has now assumed, another human form." Any one with a running acquaintance of Shirdi Baba's Leelas, His miracles, His Omniscience and Omnipresence, His teachings, His Universal Love etc., can, by merely spending a few days in the Holy Presence of Sri Sathya Sai Baba convince himself of the identify of the two Avathars. Baba Himself constantly refers to the previous Avathar; the songs sung and the Stotras used at the Nilayam, all proclaim it; there is an unmistakable similarity in speech, style, attitude, outlook, teachings. His Holiness Gayathri Swami ( a disciple of H. H. Narasimhabharathi Swami, Sankaracharya of Sringeri Peetam, and a comrade of Swami Amrithananda to whom reference has been made in previous pages) had come recently to Prasanthi Nilayam. He was for one year with Shirdi Sai Baba in 1906 and used to go to Him frequently thereafter. He told us of incidents that reminded us of the 'Don't Shoot' miracle, or the Jodi Adipalli Somappa miracle, and he gave us many anecdotes of the Shirdi Sariram that could well be related of the present manifestation also! Even some of the jokes were duplicating! The night before he left Puttaparthi it seems he had a Vision of the Guru (by which he means Shirdi Baba) in which He told him that He had left the Samadhi after eight years therein and that He had brought away all His 'properties' fifteen years later! Gayathri Swami, next morning, was surprised to hear from us that Sathya Sai Baba was born in 1926, 8 years after the Maha Samadhi of Shirdi Baba and that He had assumed the name 'Baba' and manifested all the powers associated with Shirdi Baba in His fifteenth year! The name and the powers, Gayathri Swami said, must be the things referred to by the Guru as 'properties.' So, He went away supremely happy, that he had his 'centre-view,' and did not much bother about not having the interview! A simple childlike soul he was, reminding us all of Swami Amrithananda. Yogi Suddhananda Bharathiar says that when he visited Shirdi along with Lokamanya Balagangadhara Tilak and Karandikar, Sai Baba told them that Swarajya won by the Bandook would be of no avail, for what is won by force will be lost to force; He advised that Swarajya must be won by and for spiritual progress and Prema. Sathya Sai Baba also places first emphasis on Prema or Love, Love based in Sympathy and Understanding. Already before the two great wars a materialistic pleasure-loving go-getting socially irresponsible civilisation was becoming a nightmare of Fear and Anxiety. "Between the two wars, the nightmare deepened. In revulsion from it there was a widespread turning away from individualism, and a yearning for a true community. This produced the movement for democratic socialism, but also, its perversion, totalitarianism. Both commercial individualism and the barbaric tribalism that sprang up in opposition to it were in their different ways, object lessons in the frightfulness of a world, disorientated from traditional values!" This is what Olaf Stapledon writes about Europe and the West. But, the malady has affected India and other parts of the world, too, for the world is fast becoming One. There was another reason too for the Avathar of Shirdi Baba; let Stapledon speak about the need. "Scientific enquiry itself seems to be producing important evidence, that the assumptions on which the modern wisdom has been based are false! There is strong evidence for telepathy, and also for precognition and post-cognition. It seems that future events can take effect on consciousness while they are still future, and in the orthodox view, non-existent! Similarly, with past events. All this makes nonsense of our familiar assumptions about time and about mind's temporal limitations. To cope with precognition and post-cognition and even with simultaneous telepathy, the modern wisdom will have to be transformed." Shirdi Baba, and now Sathya Sai Baba both have been doing just this, to emphasise traditional values and transforming 'modern wisdom' by familiarising us all with the miracle of precognition, simultaneous telepathy, multilocation, and many an unnamed one besides, to the utter confusion of the pundits of science, thus proving to Man that there is a God in Him that is whispering Mystery, all the time. The purpose of both the Sai Avathars is the same. Only, the need to transform 'the modern wisdom' has now become more imminent. Then, the emphasis was more on community now it is on the individual; then, it was more on Karma, now it is mostly on Bhakthi; then the message was given to comparatively few; now all are welcome to it and it is even taken to the doors of the needy. A person intimate with details of the Leelas of Sri Sathya Sai Baba, if he reads, for example, the "Sai Satcharita," written in English, by Sri N. V. Gunaji, on the basis of the Marathi book by 'Hemadpant,' will be reminded on every page of the continuity and identity of the present manifestation and the last. He will find in the book echoes of what he has often heard Baba Himself saying and seen Baba Himself doing; he will have to rub his eyes to find out whether the book in his hand is about Sathya Sai Baba or Shirdi Sai Baba! The book will tell him that Shirdi Baba used to encourage and warn those who went to Him, saying, "Be wherever you like, do whatever you choose, remember this well, that all what you do is known to me. I am the inner ruler of all. I am seated in your hearts." "Though I am here bodily, still I know what you do beyond the seven seas. Go wherever you will, over the wide world, I am with you." On innumerable occasions, Sathya Sai Baba has said the same thing. While devotees were discussing at Prasanthi Nilayam where to stay at Courtalam, on the way from Trivandrum to Surandai, Baba said, "Wait; I shall tell you." And, next moment, He began to give a detailed description of the Travancore House there, the number or rooms, the kinds of plants in the garden, the height of the compound wall, the location of the phone in the Hall etc., etc. I began to write down the list and He dictated a few more items, including 2 bougainvillaea bushes, at each end of the porch! He had seen all that from the Nilayam itself! When we reached the Travancore House, the list was verified and found correct of course, down to the very minutest, detail of a neglected rose tree near the garages! He has proved to His devotees that He is with them always and that He knows every little thing they do or think or speak. When a devotee came some years ago to Puttaparthi, He told him that His ears were suffering pain, because of the Bhajan in his house! The reason, He said , was "a neighbour who came in and joined the chorus, though his voice was quite unmusical; he did not know how to adjust the tone and tempo of his voice to the tone and tempo of the rest." The reference to the pain was of course a jest; but, how could He know of the grating voice unless He actually heard? He astonishes people by telling them all about their inmost thoughts, and their most private deeds. An Inspector-General of Police who was standing in queue, outside His interview room, told his friend, a little challengingly, "Here, there is one incident in my life, which if He reveals to me, hats off(!) to Him!" And, his turn came; the interview was over; he came out of the room, full of joy and satisfaction, announcing, "He knows everything from A to Z, official and unofficial," He reads every one like an open book. When a devotee took to His Presence and offered articles purchased for the use of another but latter considered valuable enough to be taken to Puttaparthi He immediately said "No! no stolen articles, please!" and gracefully indicated His displeasure! Very often, Sathya Sai Baba has told persons starting on a voyage or on a pilgrimage, "Purchase three tickets for the four who travel," meaning that He will join them as a ticketless passenger! While His physical body is at Puttaparthi. He once saved a pilot from suicide at Kashmir. This was twelve years ago, and the facts were verified by those who actually witnessed the 'trance.' Baba was away from His body for about twelve hours, and He told those around Him that He not only dashed the fatal cup from the pilot's hand but entered the court-hall where the case against the pilot was being tried and made one of the military judges raise an objection which virtually foiled the prosecution and forced the court to pronounce a verdict of "not guilty!" The pilot, Baba said, was a staunch devotee of Shirdi Baba and was unjustly charged with embezzlement of public funds! Mr. Gunaji writes of Shirdi Baba, "Shirdi was His centre, but, His field of action extended far wider, to Bombay and Calcutta, North India, Gujarat, Deccan and South Kanara." The same is true of the Sathya Sai manifestation; devotees who have gone to England, France, Canada, Japan and Germany have felt His protecting Hand in those places. Mr. G. V. and Mrs. G. V., for example, proceeded to the Continent and planned from there to attend the Coronation Ceremonies of Queen Elizabeth II. They were shopping in Paris, when they discovered to their utter dismay that the bundle of travellers' cheques they had, was lost! They could not locate it in spite of the most desperate search, even in the most unlikely places. They were overcome with sorrow when they contemplated the shame and disappointment that were in store for them, in a strange land. They turned to Baba, as they always did when in distress; and Baba heard their pathetic cry, though they were thousands of miles away! Next day, while dipping the fingers into the selfsame purse for something else, they were amazed to find inside it the entire bundle, intact! Two of Baba's classmates while He was a little boy at school joined the army and were caught in the flames of a fire that blew up a petrol tank. (Baba said that the accident took place somewhere in the North-east Frontier and this fact was verified some years later when the boys arrived home, after the conclusion of hostilities) Baba at Puttaparthi immediately left His body and proceeded to the spot and, as He said, prevented the fire from spreading to the tent where the boys were, though the flames encircled the area. The Sai Satcharita says, "Goulibhava, aged 95, who made his Vari to Pandharpur saw Shirdi Baba as Vithoba and exclaimed "This is Panduranga Vittal, incarnate, the merciful Lord of the poor and the helpless." Last year, a family of devotees went to Shirdi and from there they attempted to travel to Pandharpur also, but owing to heavy rain and floods and the consequent cancellation of trains, they could not proceed further. They came to Puttaparthi, and as Baba was talking with them before they left Him, asked the aged father and mother of the group, "You could not see Panduranga, isn't it? You seem to be very sorry that your pilgrimage had to be cut halfway. Well, if you want to have a Darsan of Panduranga, loot at Me." They looked, and danced with supreme joy, for, Baba Himself had become Panduranga for their sake. Of Shirdi Sai Baba, it is said, that He was of the form of Rama, Krishna, Siva and Maruthi. The Satcharita gives an instance of a doctor, who when he went to Shirdi Sai Baba "saw his beloved deity, Rama, on the seat before him." Sathya Sai Baba has, as devotees no doubt know, granted visions of Himself as Rama and Krishna, and Kamakshi to Bhakthas. Perhaps, the experience of Swami Amrithananda at Puttaparthi might be a very valuable example, of this aspect of the Divinity of the Baba. As soon as Swami Amrithananda reached the Prasanthi Nilayam, Baba accosted him, "Amritham," and, he was genuinely astonished at the familiarity and even affection with which that call was saturated, for, he said, "Only Ramana Maharshi with whom I spent 17 years used to accost me thus and the voice and manner were exactly the voice and manner of the Maharshi!" this is a miracle, indeed, if ever there was one. Later, Baba asked the 85 year old Swami, about a Ganapathi Homam that he had performed for 41 days in his seventh year! He told the Swami all the details of that Homam, including the long involved Manthra with which the offerings were placed each time in the fire. The Manthra as disclosed by Baba begins "Om Sreem Hreem Kleem Gloum Gam." Baba told him that he had repeated this Manthra a thousand times a day, for forty one days and made as many coconut offerings in the Fire of the sacred Homa. But "What is the reward promised in the Sastras?" Baba asked the old ascetic. He said that the Sastras declare that, if the Homa is done with scrupulous regard for ritual, Ganapathi Himself will appear in the Homakunda as the golden-coloured effulgent elephant-headed God and with His trunk He will receive the final and concluding offerings and He will grant everlasting Bliss by means of the Darsan. Baba asked Him whether he had the Darsan. Amrithananda replied that it was not so easy for a seven year old boy to get the Darsan of the Lord, by the mere number and quantity of offerings and Manthras. But, Baba interrupted him and said, "No, no. it is due to all that Japa and all that Homa that you have come to Me now. You will today, after an interval of seventy eight years get the reward, mentioned in the Sastras." Then, He asked the swami to look at Him and, lo, Amrithananda saw the golden coloured Elephant, the Ganapathi as described in ancient texts. He was beside himself for about four days after this Darsan and forsook food and drink and sleep, in the Bliss which he derived therefrom. It is mentioned by Hemadpant that Shirdi Baba, "the famous doctor of doctors cared not for His interests and always worked for the good and welfare of others, Himself suffering unbearable and terrible pain many a time in the process." This is true even in this manifestation of Shirdi Baba, for Sathya Sai Baba has taken upon Himself and suffered mumps, typhoid, fever, delivery pains and the scalding burns of His devotees. "My ear began to bleed profusely, all of a sudden and it gave me pain. I suffered much for a day, but, the pain and bleeding subsided miraculously," wrote a doctor from near Madurai. The letter reached me, just when Baba Himself was 'free' from a slightly bleeding ear and some earache, which He had announced as having been "taken over" by Him from a Bhaktha, who was suffering the agony. It was on the 21st June, 1959 that Baba's temperature suddenly shot up to 104.5 degrees, at about 1-30 P.M., but, the alarm of the devotees was considerably reduced when, five minutes later, the thermometer registered a fall and indicated 99 degrees! No one knew the reason for this sudden rise and this equally sudden fall, till about 9-30 P.M. that day. During dinner that night, seated on the terrace in the moonlight, Baba asked a young man from Madras who was also dining with Him, "When you go to your mother tomorrow, tell her that she should be more careful about fire; assure her that Baba is always with her and she would never come to harm." This naturally aroused the curiosity and the anxiety of all and, when Baba said that the lady's sari had caught fire that noon while she was praying, standing in the shrine-room of her house with a number of oil lamps on the floor, some one got the idea of putting through a trunk call. It was done; the lady came to the phone and gave further details of the accident. When Baba spoke to her, her first query was whether His Hands were burnt in the process of putting out the flames; as she knew of such instances of His Mercy. Baba answered, "Oh, no. I did not burn My hands. I had just an increase of temperature, for a short while!" So, that was the cause of the sudden rise and the sudden fall, contact with flames in the shrine room of a house in Madras, 222 miles away! Shirdi Baba once had His arm scorched, while saving a child from fire. The accident happened miles away, but, Shirdi Sai Baba said, "The child slipped into the furnace. I immediately thrust my hand into the furnace and saved the child. I do not mind my arm being burnt; but, I am glad that the life of the child is saved." The Leelas are the same in both the manifestations. The Sat Charita gives many cases of illness which were cured by Shirdi Baba, by a mere command, like "You should not purge any more" "The vomiting must stop," "Your diarrhoea has stopped," "Do not climb up, O snake poison," et. Here again, Sathya Sai Baba continues the same miracle and cures diseases however long-standing, by His Sankalpa only. An old merchant from Kuppam given up as 'dead' was kept for 2 days because Baba did not give word to proceed with the disposal of the body. On the third day, Baba ordered him to get up... and he obeyed! There was a young man from Salem, who was suffering from acute diarrhoea and Baba commanded him 'not to purge any more' and the purging stopped! Then there is the case of a young girl, whose eyesight was so bad that she had to walk about her house holding the wall with one hand. She could not bear the sunlight; it burnt her eyes and gave her agonising headache. She had to be indoors most of the day, in a darkened room. She had finished the round of all the renowned optical experts in Mysore, Madras and Bombay. She spent her days at Puttaparthi in prayer and meditation. At last, one day, Baba said she could go to her house and that it would be all right with her eyes. If, however there was any trouble, "use this medicine, a few drops would do," He said, giving her a bottle of eye drops, which He 'materialised' by a wave of the hand. She went home, and... she could not believe it, her eyes were perfect in every way! He had commanded so, and the command was obeyed by her optical system! What the Sai Satcharita says of Shirdi Baba is true, word for word, in the case of the present Appearance also, "He became famous as a Hakim; without any juice or medicine being put in the eyes, some blind men got back their eyesight." The Sat Charitha says that Shirdi Baba used to say, "I am the Mother, the origin of all beings, the harmony of the three Gunas, the propellor of all scenes, the Creator, the Preserver, and the Destroyer." "His firm conviction was that He was the Lord Vasudev." Many times Baba has also announced that He has come down to save the World and that He is the Lord Himself. The present writer got the first glimpse of this profoundly true declaration, about nine years ago. Death has taken away the previous night the husband of Venkamma, the 'sister' of Baba; he was also the younger brother of Easwaramma, the 'mother'; the death was sudden and the entire family, eh, the entire village was sunk in grief. I reached Puttaparthi, unaware of the calamity, a few hours after the burial. I found Baba seated on the low wall, at the Northern side of the front portico, facing the road that leads into the Prasanthi Nilayam. The bereaved 'sister' was wailing pathetically from inside one of the rooms, her little son was with his grandmother. There was a semicircle of sorrow in front of Baba, the father, the mother, the sister, the brothers, and others, all plunged in inconsolable anguish. I walked up slowly towards Baba and tears gathered in my eyes, as I saw the gloom. Baba greeted me with a smile, and chiding me with a chuckle, said, "What? Kasturi! If there is no death, and no birth, how can I spend My Time?" I heard those words, the authentic words of an Avathar. "His way of spending time His Leela" "the Suthradhara, the Creator, the Preserver, the Destroyer, the Lord Himself." ...I cannot afford to forget or ignore that Declaration that smile and that chuckle. Samsayatma Vinasyathi, the Lord has warned us, long ago. Shirdi Baba had control over the elements, too. "Once there was an imminent fear of a terrible storm; the sky was overcast; the rains fell and the waters flooded the streets; the panic-stricken villagers ran to Baba for help; and Baba told the storm, "Stop your fury and be calm." And, all was calm at Shirdi. This account is given in the Sat Charita. He also once commanded a fire to step down and be calm, and it obeyed instantly." Many such instances are stored in the memory of the devotees of Sathya Sai Baba, too, for, this is but a continuation of the same Divine Leela. "Take the instance of the downpour held back," writes Sri Challa Appa Rao. "It occurred when He was taken in procession on the night of Vijayadasami. He sat in a gaily decorated chariot. By the time the procession started, the sky was dark and heavy with storm clouds. There was deafening thunder and flashes of lightning. Truly a wonderful spectacle! It took more than three hours for the procession to return to the Mandir. Still there was no rain. Baba descended from the chariot and went upstairs and every one of us returned to our lodgings. Then, it started to rain. In fact, it poured and poured. Who else can it be if not God Himself that can hold back the downpour for so long?" It was on a cloudy June evening that Baba was addressing an open air meeting at Mercara. The sky was overcast and gloomy rumblings of approaching rain could be heard, not far away. In fact, the rain poured on the hills on the horizon, stepped nearer and nearer, and came as far as Mahadevpet, half a mile away. Baba spoke quietly and calmly, holding the audience spellbound, for over an hour and a half; at the end, He said, "Now, you can go home, for in about ten minutes you will get the rain that ought to have drenched you by now." And, wonder of wonders, the rains came, as announced, ten minutes later, to the very second! The Chithravathi River at Puttaparthi is subject to sudden floods, for it rises in the Nandi Hills and heavy rains in that region in Mysore State will bring down the waters many feet deep all along the miles. The Prasanthi Nilayam was built on an eminence away from the village to avoid these periodical floods which in some years invade the old Mandir, entering the Prayer Shed, the kitchens and all the surrounding area. On many such occasions, Baba has stood on the edge of the water and said, "Ganga! its enough, go back" and the waters have not risen more. Some years ago, during Navarathri, when the feeding of the poor was on, it rained all round the Nilayam, but not a drop fell in the precincts where people were being fed! Two years ago, Baba was in the East Godavari District, having crossed over to Rajahmundry by the very last boat that was permitted by the police to brave the turbid torrents of the flooded river. It was wet and slushy everywhere with a cold wind bringing down the drizzle almost all the twenty-four hours. At Mirthipadu, about ten miles from Rajahmundry, Baba addressed a meeting of the villagers from the open terrace of a bungalow; one could see all around the broad sheets of water formed by the swelling Godavari and the curtain of rain, advancing from all directions towards Mirthipadu. But, the rain could not penetrate the unseen umbrella over the village and disturb the meeting, which went on unconcerned, well into the night! It was Baba again, who willed that the rain shall not advance. Let us revert to the Sai Satcharita "Baba cured Bhimaji Patel by means of two dreams" "He gave instructions to many persons in dreams. To one addicted to drink, He appeared in dream and, in the dream, He sat on his chest and pressed him, until he promised not to touch liquor again. To some, He explained Manthras like Guru-Brahma in dreams." In this body also, Baba has 'operated' on many suffering patients during their dreams. Thirumala Rao of Bangalore had such an experience and when he woke, the bed was soaked in blood, and the pain had gone, what he dreamt had actually come to pass. Baba, the Surgeon, had blessed him. Dreams form a very important means of communication between Baba and His Bhakthas. Baba decides to warn, teach, instruct, treat, or 'operate', during a dream of the Bhaktha which He Himself designs and times; and, His Sankalpa is realised. 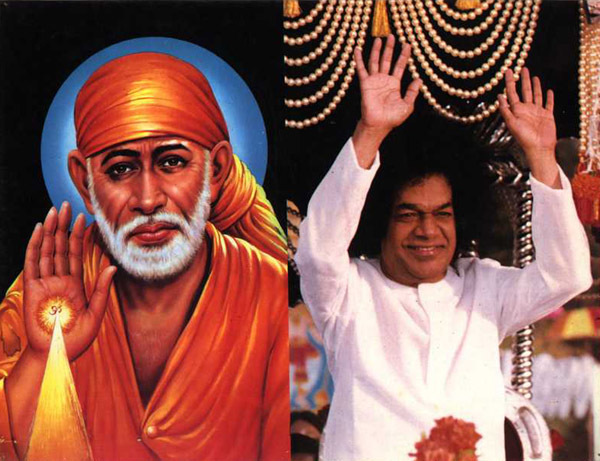 Sathya Sai Baba has initiated a number of devotees with Manthra during dreams, wherein He has granted His Darsan and communicated the sacred formula to the deserving aspirant and, later, when they have come to Puttaparthi, He has told them about the processes of Japa and the conditions for successful spiritual practice. Just as Shirdi Baba sat on the chest of a drunkard and forced him to promise not to touch liquor again (in a dream-experience, of course), Baba too has 'beaten' an intransigent son-in-law of one of His Bhakthas, while he was sleeping in a moving train, alone, in a First Class Compartment! The man jumped out of the train, as soon it halted at a wayside station and the crowd that collected could see the finger-marks on both the cheeks! An insane patient at the Hospital, Puttaparthi, was also 'beaten' in absentia by Baba, and the doctors around his bed witnessed the fellow yelling at every blow and shouting that he would behave better and praying to Baba to stop beating him, all the while wondering at Baba's mysterious way of curing the patient of his foul vocabulary. After this treatment, and the suffering of actual physical pain, the fellow gave up his 'billingsgate' and sang always Bhajan songs! So, here too, one can see the continuity, the identity. On page 167 of the Sat Charita is given the case of a Punjabi boy who saw Baba in a dream and heard Baba commanding him to come to Shirdi. He did not know who Baba was and where Shirdi was, but, luckily he came across a picture of Baba in a shop and so, could, after many adventures arrive at Shirdi. Many instances of exactly the same nature come to mind, concerning this Avathar also. The Principal of a college in South India was surprised when his son, afflicted with some dire heart trouble, said one day that he had dreamt of a place called Puttaparthi where he would be cured! He made enquires, consulted the Railway Time Tables of all the zones, got a copy of the Post Office Directory and was surprised to find that Puttaparthi was a village that existed, for it contained a Post Office. Further enquires gave him the precious news that Sri Sathya Sai Baba was there and that He could by His mere Will cure all afflictions! How Baba called the great devotee of Sri Thyagarajaswami, Bangalore Nagarathnamma to Himself is an interesting story. In 1951, the Raja of Venkatagiri was surprised to receive a letter from her. The letter ran as follows: "Mahaprabhu! My Ishtadevatha Sri Thyagaraja gave me Darsana Bhagyam in a dream and commanded me to go to Venkatagiri, in order to be blessed by the Darsan of Bhagavan who has come to Bhuloka and who is soon reaching Venkatagiri, in His Sancharam. My lord told me that Bhagavan has assumed the name of Sri Sathya Sai. I shall come to Venkatagiri as soon as I hear from you." It was the Utsav of Krishna Jayanthi, when she met Baba in answer to this command; Baba gave her the chance to sing Thyagaraja Krithies for full two hours in His Presence. He also blessed her with an Image of Sri Rama, which He materialised for her; after the Receipt of that Image, she was in ecstatic unconsciousness for over 24 hours! She was happy that Baba granted her two boons, a peaceful end and remembrance of Ramnam till the very last moment of her life! Hundreds of people come to Puttaparthi drawn by such mysterious intimations. For example, there is the case of Sukumara Menon, who was 'called' by phone(!) by Baba's Voice to meet Him, a call not noticed anywhere along the line, a call that rang in his room, when Baba was actually at Bangalore in the midst of a Grihapravasam Function. Sukumara Menon wrote to me about the Mysterious ring and the conversation he had with Baba. When this was mentioned to Baba He said, "You know this now, because he wrote about it. But, remember this is only a millionth part of My Leela!" In fact, what is mentioned on page 68 of Sai Satcharita can be taken as a correct account of what happens today at Puttaparthi. "The devotees could never approach Him unless He meant to receive them. Nobody could go there of His own accord; nobody could stay there long if he so wished; they could stay there only so long as Baba wished them to stay; they had to leave the place, when allowed to do so by Baba." Once, when a long line of bullock carts approached Puttaparthi from Bukkapatnam bringing visitors from various places, Baba sang jubilantly, "Aaya hai! Aaya hai! Babaji Ka Karavan! "I said, "People who come here go and tell their neighbours and friends and relatives and so, the number increases." Baba turned towards me and, remarked, "No! no one can come to Me without My calling him, even if a hundred people persuade or drag or push." Every one who comes to Puttaparthi leaves with the prayer, "Help me to come again," "Kindly get me once again to this place," for, they know that without His express wish, no one can fulfil the pilgrimage. And, when He says, "Stay," they stay, whether they have 'leave at the office' or not; when He says, "Don't go," they don't; when He says, "Leave," they leave, however unwillingly, for, as the devotees at Shirdi experienced, when they do scrupulously follow Sai Baba's orders, some urgent work will be awaiting them when they reach place! It is not necessary to multiply such instances of identity of attitude, style, advice, behaviour, and Leela between the two manifestations. Devotees of Sathya Sai Baba have heard Him assure them, "Why fear when I am here?" "You look to me, and I look to you," "All your sins are forgiven the moment you get My Darsan" "I shall carry all your burdens," "Take, take as much Ananda as you can from Me and leave with Me all your sorrows," assurances which were given to many fortunate souls, in identical terms, by Shirdi Sai Baba, as contemporary records testify! " I do not need any paraphernalia for worship, either eight fold, or sixteen fold, I rest there, where there is full devotion." "My Sircar's Treasury is always full; it is over flowing; I say, 'Dig out and take this wealth in cartloads; this chance won't come again'; "Let there be no insistence on establishing one's own view; no attempt to refute other's opinions" "Nothing will harm him, who turns his attention towards Me"; "Avoid the company of atheists, irreligious and wicked people, be meek and humble towards all." "See Me in all beings; all the insects, ants; the visible, movable and immovable world is My Body and Form." "My treasury is full and I can give anyone what he wants, but I have to see whether he is qualified to receive what I give"; "To get realisation of the Self, Dhyana is necessary; if you practise it continuously the Vrittis will be pacified"; "Give water to the thirsty, bread to the hungry, and your veranda to strangers for sitting and resting"; "if you are inclined to give, give; if you are not inclined to give, do not give. But, do not bark like a dog"; "I require no door to enter; I always live everywhere"; "Fondness for things or attachment ill becomes an ochre garb"; for "God the quest should not be made on an empty belly"; "Leaving out your pride and egoism, surrender yourself to Me who am seated in your heart"... these expressions taken from the book, Sai Satcharita can be heard emanating from Sathya Sai Baba, every day, during His conversation with devotees. For, the Mission and the Master are the same! Again, the Satcharita says that Shirdi Baba wanted some one to throw aside blind belief in horoscopes and predictions of astrologers and palmists, for it weakens man. Sathya Sai Baba also has advised similarly. In fact, there is the instance of a Vaisya gentleman from the old State of Hyderabad, who dreamt that Baba asked him to extend his palm and with a sharp pointed knife, Baba drew a line on his palm, the Bhagyarekha, as he discovered next day, to his delight and dismay! For one who can draw a new line on the palm, of what concern is palmistry? For one who can change the courses of the stars, of what value is astrology? No wonder that, that Baba and this, decry man's stupid faith in these absurdities to the exclusion of the Maker of One's Destiny, Baba Himself! Other statements in the Satcharita, like 'All people troubled Him with bringing costly, unnecessary and useless articles; all the paraphernalia of Shirdi Samasthan was brought by various rich devotees at the instance or suggestion of some others.' "Baba never like people to run into debt for taking His Darsan, or celebrating and Holy Day or going on any pilgrimage," "Baba anticipated and forestalled the calamities of His devotees and warded them off in time," "Baba respected the feelings of His devotees and allowed them to worship Him as they liked," "Baba was extremely forgiving, never irritable, straight, soft, tolerant and content beyond comparison," "Baba read and understood all the thoughts of His Bhakthas; He suppressed the evil thoughts and encouraged the good ones" - all these are applicable in full measure to Sri Sathya Sai Baba too. The Sai Sat Charita says, "Sai Baba knew well all Yogic practices". Swami Amrithananda, a companion of Bhagavan Ramana Maharshi during His austerities, acknowledged that Sathya Sai Baba knew Yogic science, more than any one he had come across, because He elaborated to the Swami the faults committed during their Yogic exercises years before Baba took 'birth' at Puttaparthi, which resulted in both of them becoming afflicted with asthma of a chronic type. Recently, Baba gave some very practical lessons in Yoga to a young Frenchman who had taken enthusiastically to the practise of Hatha Yoga, through a study of mere books. Many cases of misdirected practice of Yoga come to Him every year for treatment and correction. The following sentence from the Sai Satcharitha could as well have been written about the present Avathar! "To him all duties are alike; He knows neither honour nor dishonour." Sathya Sai Baba too attends to the smallest detail of the lowliest task at Prasanthi Nilayam. He sits on the floor, sleeps on a mat, does not hesitate to walk in sun or rain, climbs the snow-clad Himalayas on bare feet, gets a sizeable crowd into His car in spite of the crush and the length of the journey, goes long distances without food or drink, and prefers the dishes of the poor, because as He says, "No one should be put to extra expense and trouble on My account!" The book says of the previous Avathar, "Baba read his heart and spoke it out," "Baba had already received a wireless message," "Baba converted by his touch raisins with seeds into seedless raisins," "Baba gave instructions to His devotees in both spiritual and temporal matters," " Baba saw no difference between caste and caste, and even beings and beings," Baba always loved those who studied Brahma Vidya and He always encouraged them," "Baba hated scandalmongering and spoke of it as equal to gorging dung," "Baba insisted that remuneration for labour must be paid promptly and to the satisfaction of the worker," every one of these appear, to those who have met, heard and followed Sathya Sai Baba, as His own statements and as representing His own advice and attitude. In 1958, when He was examined on commission Sathya Sai Baba referred to a similar incident in His previous birth and gave the selfsame replies. When asked His name He said, "He answered to any". He said that everything was His, that He lived everywhere and by these replies, He made the pundits of Law describe Him as inscrutable, though, for adepts in spiritual lore, it was clear as crystal that those were the unmistakable utterances of an Avathar. The truth of the matter is that it is the same Presence, come again! Sathya Sai Baba once said that this Sariram was born in Parthi; while the previous one was born in Pathri; in this birth also there was a Muslim who loved Him and fondled Him as a child; in this birth too He drew people's attention to Himself, when a boy, by disclosing the whereabouts of a lost horse at Uravakonda; and that many more resemblances are to follow. Every one will find in the present Avathar the same motherly solicitude, the same simplicity of exposition, the same profundity of wisdom, the same universality of outlook, the same all-conquering Prema, the same Omnipresence and the same Omnipotence. Sathya Sai Baba has said very often that He "Had been to Shirdi," when He was in what may be called a 'trance.' On one Pournami Day, some fifteen years ago, Baba was taking His noonday meals, with a young man from Madras at Puttaparthi. The person who was serving the dishes did not know that it was an auspicious day for Sai Bhakthas. Suddenly, Baba 'went on a journey' and, during the unconscious period, He ordered, "Serve him chapatis." "Serve him Kheer" and mentioned strange names of other sweets and eatables. When He 'returned', the lady twitted Him and said "If You ask me to serve this young man items that I have not prepared, that I have not even heard about, what can I do?" Baba sympathised with her plight and said that He had been to Shirdi and the names He mentioned were of Marathi dishes! He, then, 'took' a Chapathi as well as some slices of Marathi sweets, and gave them to the young man. When He came back to Puttaparthi, after the Declaration, that is to say, as a little boy of fifteen, He 'took' a fruit, which no one at Puttaparthi had seen or tasted before. Peddavenkapa Raju's sister says that she asked Baba what type of fruit it was and she got the reply that it came from Shirdi! Baba proposed to cut and distribute the pieces during the evening Bhajan, but, she pleaded with Baba that each should get at least one full fruit, so that the gift may be relished; so, Baba asked her to give Him a big sized basket with a cover. He just tapped that basket once and the lady saw that the basket was full of them! In the evening, when Bhajana started, she saw about a hundred persons and so, she was again afraid, she would not get a whole fruit for, the basket could not contain more than 30 or 40! She told Baba how nervous she was, but Baba gave from that basket one whole fruit to each of the hundred odd persons, after Bhajana that day; and the fruit was so strange and so sweet! This same lady relates another miraculous incident. She was troubling Baba with a request to grant her some vision, to instil faith in her heart, for, she did not want to dismiss the story of Sai Avathar as an invention, an attitude that many in the family found it easy to assume. Baba had a liking for this particular lady, because she was a simple soul, steeped in suffering; so, He told her, "I shall show you My previous Body, this evening"! She confesses that she could not contain her joy and was praying for a shorter afternoon and a quicker sunset! As soon as dusk fell, Baba led her across a number of door-sills, into one of the innermost rooms of the house, and on reaching the farthest, He took off His palm which was all the while covering her eyes and asked her to look at a corner, which He pointed out with His Finger. The lady looked! And, there sat Shirdi Sai Baba, on the floor, in His characteristic pose, but, she says, with eyes closed and Vibhuthi marks on the forehead and arms. The incense sticks before Him were burning and the smoke was rising straight into the air! His Body was glowing with a strange effulgence and there was a beautiful fragrance around. After a minute or so, Baba asked her, "Have you seen?" and, when she said, "Oh, how wonderful! ", He placed His palm once again firmly over her eyes and led her back into the outer room. Perhaps, the vision vouchsafed to the two teachers who have written that book, Messrs Kondappa and Subbannachar was also of the same type. They do not specify which, in any detail in their book. Baba has often said that controversy over the point whether it is the same Baba is meaningless and unnecessary, for, as He says, when there are two pieces of "Barfi," one square, another circular, one yellow and the other purple in colour unless one has eaten and realised the taste of both pieces, one cannot believe that both are the same. Tasting, experiencing, that is the crucial thing, to know the identity.